Frank has over 25 years’ experience as a creator, curator and producer of outdoor events and festivals. 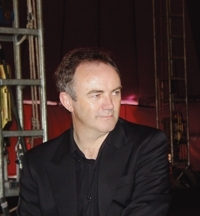 In 1988 he founded the Stockton International Riverside Festival, one of the UK’s most important annual outdoor arts festivals, standing down as Artistic Director after the 25th edition in 2012 but continuing a close relationship with the event in the new role of Associate Artistic Director. Beginning in 1992, when he worked as a programmer on the UK- government sponsored European Arts Festival, he has undertaken a number of high profile projects as curator and creative producer both in this country and abroad. Since the end of 1999 these have been delivered through his company, Event International. For 10 years Frank has been the international programmer for the Chaoyang International Spring Carnival in Beijing. Other international projects have been undertaken by Frank and Event International in Europe, China, Dubai, Australia and North America, including programming, production and tour management. Frank was Padrino (official adviser) for performances in Public Spaces at EXPO 2008 in Zaragoza. UK projects include Millennium Eve celebrations in Newcastle and Leeds; a multi-media performance for the 2005 Tall Ships Race that attracted an estimated audience of 150,000 people; a four week project by the Australian company Bambuco to construct a bamboo suspension bridge across the River Tyne; and a summer festival in London’s Trafalgar Square. In 2012 Frank was a co-producer for ‘Prometheus Awakes,’ presented in Greenwich and Stockton as part of the London 2012 Festival. Currently Frank is developing large-scale projects with Metro Boulot Dodo, Nutkhut and Alchemy Fireworks for presentation in 2013-2015. He has played a active role in the development of partnership networks in the UK and Europe, including Without Walls, Eunetstar and Meridians; the last two with funding from the EU.